Notice: Today’s post is a bit more personal than most as it occurred just across town from me and involves people I know. The story begins a year before Hurricane Katrina when Joshua Short was the subject of a critically acclaimed documentary about the relationship between political corruption, our failing schools, and the plague of youth gun violence that have been the pernicious back beat to life in New Orleans for much of it’s history. Let’s start with the trailer for Left Behind; be warned that the language is raw and unedited (containing at least one F-bomb and Not Safe For Work). Hurricane Katrina arrived in mid-filming for the documentary, and to their credit the filmmakers, my old friend and colleague Jason Berry and Vincent Morelli, forged ahead giving an unprecedented view of our at-risk population when under historic levels of stress. Joshua and his brother, two of the main subjects of the film were living together in an apartment, putting themselves through school, parents long gone from the equation, when it was in production. The young man was inspired with a love of the medium and has since worked for Berry on several occasions. This last Spring he assisted Berry in recording an outdoor Jimmy Buffet concert during the NCAA Men’s Final Four basketball championships. He was bettering himself, trying to be one of the survivors to claw his way out out of the morass of poverty and disfunction that was his ecosystem. This year, at the age of 25, he had already become that “one good enough adult” that we talk about here on the blog: the one adult who can make a profound difference in the life of a child. He tutored disadvantaged youth in his neighborhood and taught them basketball. Yesterday, this city…you, me….we are all responsible…took the life of one of its brightest. Joshua was a young man that gave me, and the people in his life, hope. In spite of the horrendous circumstances he was born into, he continually found a way to rise above it all and strived to make better himself and the people he loved. The challenges he faced in his life, as a child, would make most adults crack but he somehow managed to rise above it all. The world of sh*t this city threw at him from the cradle on didn’t harden him or destroy his soul like so many other kids in his circumstances. His hope and kindness humbled me to the point where whenever I, as a 40 year-old adult, would begin to feel sorry for myself, I would think about what Joshua had been through and how ridiculously privileged my own life really is. If he could remain optimistic, I have no business wallowing in self-pity. Authorities haven’t publicly discussed exactly what unfolded when Short was shot about 10:40 p.m. on Tuesday. Jonathan said his brother had gone to the Night Out Against Crime gathering to greet friends and visit the youth he was mentoring. Jonathan doesn’t believe the deadly gunfire was meant for either his twin or his friend. Berry lamented that Joshua Short became the second student profiled in “Left Behind” to fall victim to shooting violence in New Orleans. The first, Mario Pleasant, survived when he was attacked in the middle of filming the documentary. That is why everyone needs to develop an interest in these matters. While progress is being made in many places, it is hard to see any here in the Crescent City. This is a cautionary tale about the consequences of neglecting our children and their future. Berry’s documentary showed the complex interrelation between education, lack of opportunity, and juvenile crime in a visceral fashion. Six years later our inattention to those matters has claimed another victim. Why is it vital to push for change? Because New Orleans is an example of just how bad it can become everywhere if we don’t. This has nothing to do with politics; it has to do with wasted futures and blood on our streets, lives cut short and public money wasted. If your stance is conservative, you should support this because it is the path of fiscal savings and responsibility. If you are liberal, then compassion for the children should guide you along the same path. I’ve been back in New Orleans for just under a year now, and once more I have read the headlines to learn someone I know was shot in the streets. I completely understand Jason’s depression and fatigue; it often feels like we are treading water at best. Still, there is no way in good conscience to sit on the sidelines while this is the norm anywhere in the United States. It really is more expensive to do nothing. Charter schools are a different breed. 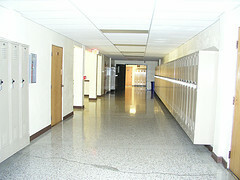 Unlike other schools they operate according to a charter with the city or state, usually for a period of five years, and if they are not producing results at the end they are closed. While the funding comes from the government, charter schools are independent of the teacher’s unions. They also boast other qualities that education proponents generally seek – a longer school year, longer class days, and the ability to fire teachers whose performance is not deemed up to par. Sounds great, doesn’t it? Unfortunately there are not enough charter schools to go around, particularly in areas that need them most. Harlem is one of those areas. In Harlem there are 23 non-charter schools. Of those 19 have less than half of their students reading at the proper grade level, and the only means of escape into the charter system is completely random – a lottery. A lottery in which 3,000 children compete for less than 500 seats. By the time the lottery takes place, viewers understand all that’s riding on it. You look at all these beautiful kids, with all the potential in the world, and every expectation for a great life, and you know that at most one-sixth of them will come out of the room with a fighting chance. That shouldn’t be. While the situation re: charter vs. public schools will vary from one community to another, the results and findings Sackler presents does make a strong argument for exploring them in other areas. Education is one of the most fundamental assets a child can have, and it’s lack is a liability of tragic proportions. You wouldn’t expect drug dealers and killers to be in­vited into Alabama classrooms — especially not to teach. But they had a message that everyone from Gov. Bob Riley and Alabama Superintendent of Education Joe Morton to the inmates themselves believed Alabama students needed to hear. The message was stay in school and out of prison. It was delivered by ‘lifers’ at Wetumpka’s Tutwiler Prison for Women and Atmore’s Holman Prison during a 52-minute video called ‘Inside Out.’ The video, created by the nonprof­it Mattie C. Stewart Foundation, was shown at tri-county area high schools last year. We have the highest percentage of the population behind bars in the U.S. than any other nation on the planet. A Northeastern University study had reported in 2009 that, on an average day, roughly one in 10 male high school drop­outs between the ages of 16 and 24 was incarcerated. With high school grads, that number is down to one out of 35, and it’s only one out of 500 among the college graduates. In 2002, the Harvard Civil Rights Project study found that 68 percent of prison inmates are high school dropouts. ‘I wonder where I would be now if I had stayed in school and gotten the kind of education my parents had been en­couraging me to get?’ says a male inmate at Holman serving life without parole. Obviously, we believe in the power of personal narrative, especially in situations like this one. It is easy for a child to view the possibility of future incarceration as an abstract. When it transmutes into a real person, the impact is magnified many times. As always, putting a human face on these issues is vital. These raw, basic stories of humanity have a better chance of striking home than sanctimonious pronouncements or dry factoids. Especially when we’re talking to children. We will be returning to this topic with our next book, Born Not Raised: Kids at Risk, which explores the troubled psyches of youngsters serving time in juvenile hall. The book showcases a variety of creative tasks taken on by the young detainees — writing projects, artwork, elicited responses to photographs. The revealing results underscore the Humane Exposures’ conviction that early education and youth development are the most effective strategies for breaking the cycle of at-risk behavior and helping our youth thrive. Look for the announcements about the publication date soon! Image by dave_mcmt, used under its Creative Commons license. HUMANE EXPOSURES films is proud to announce that It’s More Expensive to Do Nothing, our documentary about the flaws in our penal system and their possible solutions, has taken second place at the Bayou City Inspirational Film Festival (BCIFF) in Houston, TX. We would like to thank everyone who has attended the festival, and everyone who has shown us support so far! Each one of you is an important part of the process as we work towards change, so thank you all! * Display positive relationships, morals, individual, and family values. * To showcase the artistic excellence of children & youth in Houston and surrounding areas and provide scholarships to assist them in furthering their arts education. If our film hit home, or even if you just have an interest in this issue, please take a moment and share it with a few of your friends. The wider audience we can reach the better chance we have of not only alleviating the trials of those stuck in the vicious cycle, but also doing it in a way that reduces the cost to society and government. It truly is much more expensive to do nothing! 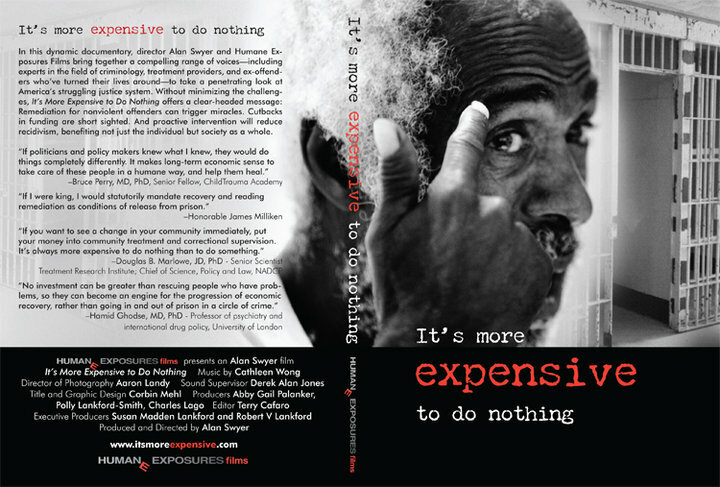 Image copyright Susan Madden Lankford, from the HUMANE EXPOSURES films documentary “It’s More Expensive to Do Nothing.” Used with permission. Someone looking at our books and our film for the first time might as well ask how we got started down this particular path. 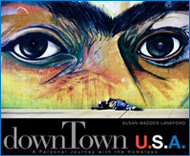 The roots of Humane Exposures go back 15 years and begin with Susan Madden Lankford’s interactions with the homeless. Having managed a successful portrait studio for years, she has decided that she wanted to do more. Renting the Seaport Village Jail, she then began photographing the homeless and collecting their narratives. Since many of those had involved incarceration, it was only natural that Lankford’s next step be touring the seven main jails in the area. That tour brought her to Las Colinas, the county’s only all-women jail. It was then that Lankford has realized that prison reform is urgently needed, and decided to share the inmate’s situation with a the public in hopes of spurring that reform. Thirteen years ago, an inmate at the county’s only all-female jail said something startling to San Diego photographer Susan Madden Lankford. ‘Hey Susan, I have something to tell you: I found maggots in my sweet potatoes last week,’ Lankford said the inmate told her. The 284-page book describes how Lankford obtained Kolender’s permission for the project in the mid-1990s. Primarily in 1995 and 1996, she conducted interviews and took black-and-white photographs of inmates, guards and jail overseers. The book features 326 of those images, as well as journal entries and letters from several inmates from 1997 to 1999, research on domestic violence and drug and alcohol abuse, and a section on white-collar crime. Incarceration is often a factor in homelessness. Education and early home life have a huge influence on children and are negative early environments, often contributing to the future criminal activity. Patterns of abuse and neglect cycle through generations. If we shift our societal focus to actual rehabilitation into society, we can not only impact homelessness but also greatly reduce the state expenditures incurred. For example, if homeless people had access to health care, it would cut millions in emergency services costs accrued over the course of a year. Later this year we will be releasing Born, Not Raised: Kids at Risk, in which we will explore the troubled psyches of youngsters serving time in juvenile hall. Without education and other humane assistance, many of these youth will be caught in the revolving door of institutionalization. All of these projects relate to each other and, taken together, try to present, one aspect at a time, the complex and interrelated nature of the societal breakdowns they address. So, tell us, how did you discover Humane Exposures, and when? We’d love to know! 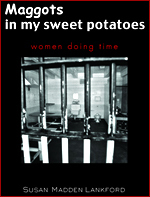 Image copyright Susan Madden Lankford, from the book “Maggots in my Sweet Potates: Women Doing Time.” Used with permission. HUMANE EXPOSURES would like to salute Davis Guggenheim. The director on An Inconvenient Truth has a new film out, and he is hoping that it will spark a dialogue about education in the same way his prior film has generated debate about climate change. 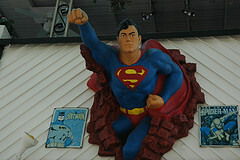 Waiting For Superman is nothing less than an S.O.S. on behalf of our school systems nationwide. A call for awareness and action on this subject which affects us all. So why visit a school that his kids don’t even attend? ‘Superman’ makes the point that failing schools are everyone’s problem, even if your family has options or you don’t have children at all. But, Guggenheim argues, the system can’t be changed unless the public demands reform, which is exactly what he aims to inspire with his film. Whether ‘Superman’ will start the wave of massive reforms necessary to turn a notoriously intractable system on its head remains to be seen, but it has already earned a nod from Oprah Winfrey, who dedicated an entire show to the film, and it won the Audience Award at the Sundance Film Festival. With Oprah’s powerful reach behind it, this film will get a lot more attention. Step one is always getting people to see it so that it can motivate them to explore the topic further and hopefully take action. Uncomfortable truths are important. It is when we face these and deal with them that we mature, both as individuals and as a society. Documentary film fans should visit the homes of both films on Facebook: Waiting For Superman and It’s More Expensive to Do Nothing. Each covers a different aspect of the overall problem our society faces — providing proper support for children as they grow up in order to help them be productive members of society. Our film looks at the prison system and makes a great followup to Superman as it explores the frequency with which the issues Guggenheim examines impact those children in later life. Image by emilydickensonrisdesabmx, used under its Creative Commons license. The Newburyport Documentary Film Festival, now in its third year, presents 20 films. Three judges will rate the films in a number of juried categories, and, in addition, an audience-adjudicated award will also be given. This year, one of those films will be It’s More Expensive To Do Nothing from our very own Humane Exposures Films. The film is directed by the award-winning Alan Swyer, who is known for work ranging from The Buddy Holly Story to the recent documentaries such as Béisbol: Yesterday, Today and Tomorrow, which he has worked on with Andy Garcia. You can see It’s More Expensive To Do Nothing, as well as a host of other important works in the documentary genre, on September 24 through 26 in the historic downtown Newburyport, MA. The two venues, The Screening Room and The Firehouse Center for the Arts, will be the site of the film screenings during the film fest. If you find yourself in MA on those dates, come on down and check out the film! It’s More Expensive To Do Nothing will be screened on Sunday, September 26, at 2:00 PM at The Screening Room. If you don’t want to take a chance on missing it, you can purchase tickets in advance. Logo of The Newburyport Documentary Film Festival is used under Fair Use: Reporting. Oprah Winfrey has a new cable network debuting next January, and that means a need for programming. In an interesting move, Winfrey has announced a new series of documentaries co-produced with some of her celebrity friends. OWN: The Oprah Winfrey Network is scheduled to launch next year, and will replace Discovery Health on cable systems around the country. That network is now in 80 million homes, although its reach could grow by the time the network — which has been delayed by a year — gets started. Executive producers Gabriel Byrne and Leora Rosenberg, producer/director Steven Cantor and Stick Figure Productions present TENT CITY, a documentary exploring homelessness in Nashville, Tenn. With the economic recession, a growing number of people are finding themselves in a position they never imagined, homeless. TENT CITY explores a community of nearly 100 homeless individuals who live under a downtown bridge. The group is self-sustained and self-governed. They work to stay together after a devastating flood destroys their land and forces them to evacuate. As a result of the disaster, for the first time in Nashville history, the municipally run Homeless Commission has opened one seat on its council to a resident of Tent City. This opportunity will allow the winning Tent City individual the chance to spearhead the search for a new location. TENT CITY will follow the four candidates as they vie for election and the process of moving the camp and keeping the community together. ‘Shelter and home are the most basic human and fundamental human rights, yet increasingly in one of the world’s wealthiest societies, more and more of us are losing our homes. How we address this social epidemic may very well determine our future. This isn’t an abstract concept but a reality millions of Americans confront every day. Our sons, our daughters, our fathers and mothers are the homeless,’ says executive producer Gabriel Byrne. This community is reminiscent of the encampments known as Hoovervilles during the Great Depression. The really interesting point is the enfranchisement of this usually neglected demographic by offering its representative a seat on the Homeless Commission council. As more and more Americans find their resources dwindling, and the prospect of homelessness looming, these issues become a lot closer to home. What do you think? Here at HUMANE EXPOSURES, we are interested in your thoughts and views, please share them with us in the comments section, or on Facebook. Follow Humane Exposures Publishing on Facebook. Image of Oprah Winfrey Network via PR Newswire, Fair Use: Reporting.